Established in 1991, ALESYS provides a fresh alternative to the many traditional consulting/training companies whose canned products are NOT providing a return on investment. Organizations are spending significant amounts of money to train their people, with high hopes for performance improvement. However, performance does not improve for more than a few weeks at most. 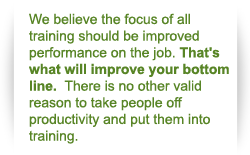 Sustained performance improvement is the main reason organizations should train their people. And that is what distinguishes ALESYS from the rest of the training companies. We know how to accomplish sustained performance improvement on the job. ALESYS believes that training is not just a one-time event. Training done well must be much more than attendance at a training session or participating in a job-related practice session. It's not just about the delivery vehicle  Facilitator-led, eLearning, mLearming, simulation, self_study, CD-ROM, etc. They're just distribution methods for passing training content along. Furthermore, the advances in technology are not producing the dramatic results many organizations have hoped to achieve. Most organizations have not learned how to leverage the power of technology effectively. We coined the term "Learning Manager" in 1990 to refer to people who have any responsibility for managing the learning process of others. That group includes full-time Trainers, as well as Team Leaders, Coaches, and peers who must teach others what they know. We also developed our innovative Workplace Learning ModelSM, which is the foundation of our Integrated Approach to Learning®. The effectiveness of these models and concepts has been proven in many industries. Over the years, we have continued to research and develop cutting-edge products and services to meet our Customers' specific business needs. We enjoy long-term relationships with our Customers that are built on trust and our ability to help them achieve their business goals and objectives. We have the processes, procedures, and people to efficiently manage your projects and get you the business results you need to achieve. Our team includes very experienced professionals in the fields of Business Consulting, Project Management, Instructional Design and Development, Technical Writing, Statistics and Measurement, Facilitation, and Information Technology. We also have a great Production Team that designs and produces our consulting reports and instructional materials in a variety of media and formats. We do all our work in-house and create extremely high-quality customized products and services very quickly.